100 hp, 460 volt motor, 110 volt digital controls. 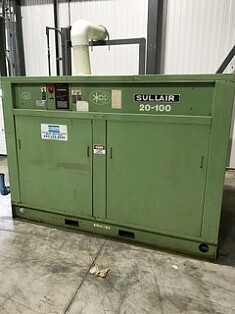 The compressor has been sitting in a building not being used for 10 years. There is a service tag on it dated 2/24/97 with 14,214 hours. On the top of the tag someone wrote in 17,816 hours, could be the hours on it now. Because it has digital controls, we will need to power it up to know for sure.